In this activity students will learn use sequencing and logic as they guide an agent through a puzzle. They also consider the best path /solution and the universality of their solution (or not). Watch videos on CS concepts of instructions and algorithms. Reflect on whether there is more than one solution or a best solution. Learning how to build a StarLogo Nova model requires students to learn how to translate an initial idea of what the turtles should do into specific instructions of how they should do it. In this activity, students will specify directions to help others recreate the safe path through a tangled maze without ever seeing it. Later we will draw a direct analogy to the conditional instruction used in programming the same behavior. Materials needed: Instructions and playing board. Red, blue and black pen or pencils. 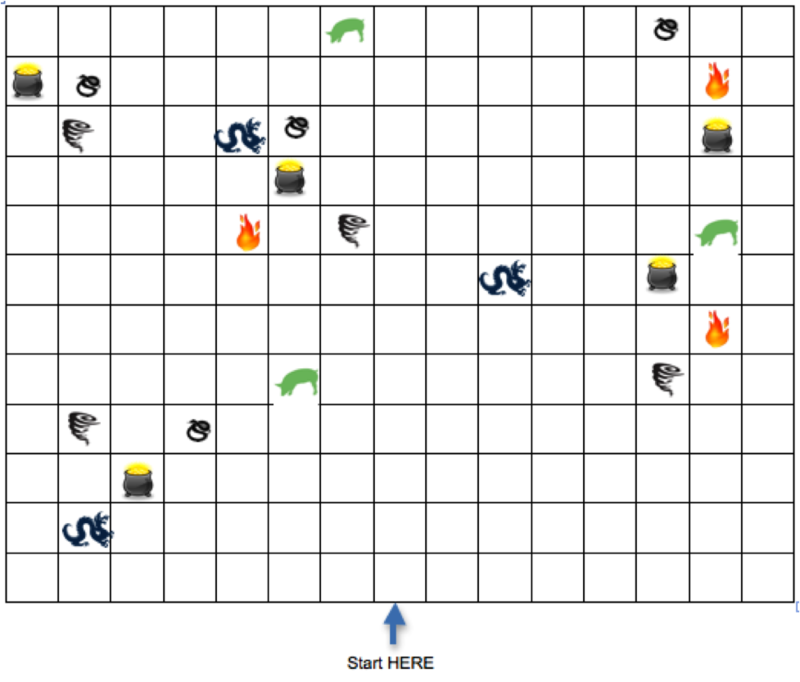 Print out the activity sheet (playing board) and gather the materials. · Take a step forward. Trade your map with a partner (or take on the role of a "Follower") and figure out if following the landmarks you left for "Followers" lead you along the path to collect all of the gold while avoiding the hazards. Reflect on the Trailblazers activity. Were you able to accurately follow the path using the signposts you left? Did you make any mistakes (such as forgetting to color certain squares or using the wrong color squares)? Post your reflection to your portfolio in "Reflections->CS Concepts" under the heading "Instructions." Then reflect on if there is more than one right solution? and if so, how would you decide which solution is best? Post your reflection to your portfolio in "Reflections->CS Concepts" under the heading "Algorithms."